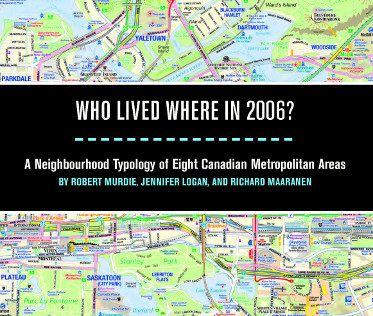 Eight Canadian Metropolitan Areas: Who Lived Where in 2006? This report introduces a typology of neighbourhoods for eight Canadian CMAs, using a joint analysis of 2006 census tract data. It includes an overview of the background literature and information on the data and methods used in developing the typology. The study draws on 2006 census tract data for 3,139 tracts in eight CMAs and includes 30 variables related to economic status, age, family, and household status, immigrant and ethnic status, migrant status, and housing status. A principal components analysis of these variables resulted in five interpretable components accounting for about 77 percent of the variance in the original 30 variables. The components are Economic Status, Family/Housing Status, Immigration/ Ethnic Status, Residential Mobility, and Immigrant Disadvantage. Robert Murdie is a member of the research team of the Neighbourhood Change Research Partnership. He is also Professor Emeritus of Geography at York University. His primary research interests include the changing social geography of Canadian cities and the housing experiences of recent immigrants, especially in Toronto. Jennifer Logan completed her master’s degree in Geography at York University in 2010. She was a Research Assistant with the Neighbourhood Change Research Partnership from December 2012 to June 2013. Jennifer has been engaged in a variety of research projects, including the settlement experiences of new immigrants, their evaluation of “home,” and the role of housing in immigrant integration. Richard Maaranen is a Research Associate and Data Analyst with the Neighbourhood Change Research Partnership. He completed his master’s degree in Spatial Analysis in 2001, a unique joint program between the University of Toronto and Ryerson University. He has provided geographic data analysis and cartography support on a wide range of research topics such as gentrification, income inequality, and immigrant settlement patterns in Canada’s largest cities.